York Neighbours aims to reduce social isolation and enable those 65+ to stay independent by recruiting volunteers who can offer help in at least one of the following ways 1) help with small one-off practical tasks eg changing a lightbulb, taking down curtains to be washed, defrosting a freezer 2) a regular phone call for a chat and to check all is okay 3) individual and group trips out for those who cannot go out alone. Many people would like to help an elderly neighbour, in need of a little bit of help, are put off by the worry things might escalate. York Neighbours makes volunteering to help easy by acting as the 'middleman'. There is no minimum time commitment - we send out a request and any volunteer can respond if it suits them - or ignore it if it doesn't! We are building community and social cohesion which not only improves the lives of older people but reduces the burden on health and social services. York Neighbours currently works with more than 120 older people but this number grows each week. Providing help with small practical tasks reduces frustration and depression and our regular phone call reduces feeling forgotten and lonely. 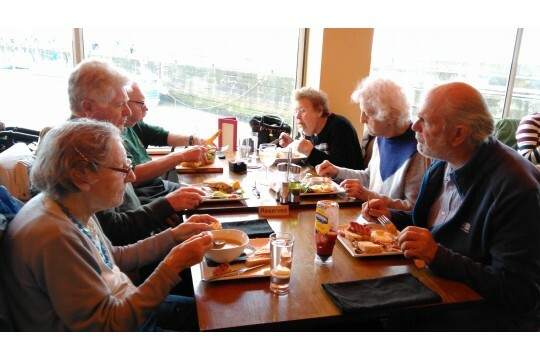 Older people tell us they get very depressed sitting looking at the 'same 4 walls' and the trips out give them something to look forward to and reduce loneliness and the feeling that no-one cares and this has a positive effect on their health and well-being.